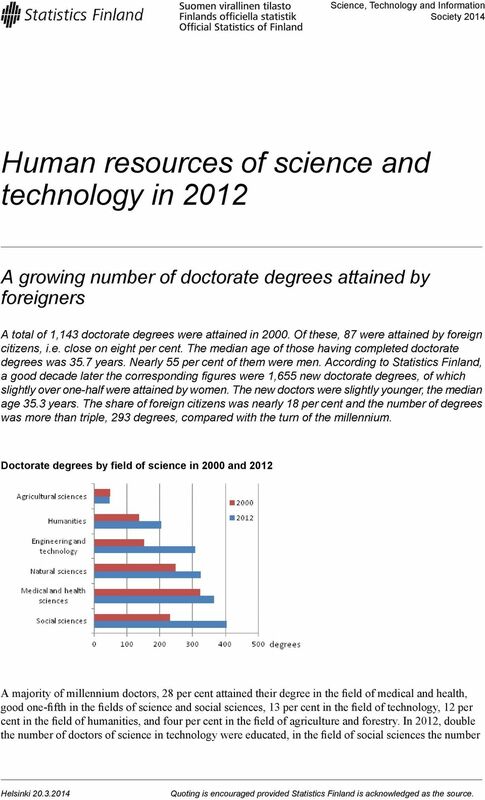 Download "Human resources of science and technology in 2012"
1 Science, Technology and Information Society 2014 Human resources of science and technology in 2012 A growing number of doctorate degrees attained by foreigners A total of 1,143 doctorate degrees were attained in Of these, 87 were attained by foreign citizens, i.e. close on eight per cent. 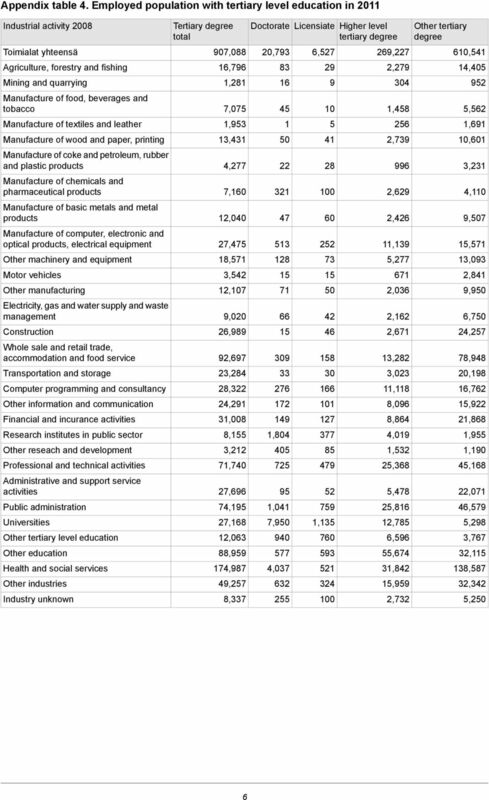 The median age of those having completed doctorate degrees was 35.7 years. Nearly 55 per cent of them were men. According to Statistics Finland, a good decade later the corresponding figures were 1,655 new doctorate degrees, of which slightly over one-half were attained by women. 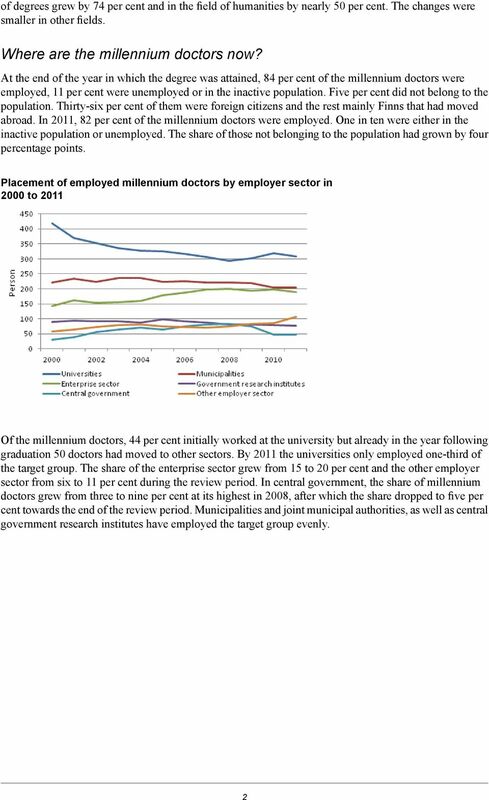 The new doctors were slightly younger, the median age 35.3 years. The share of foreign citizens was nearly 18 per cent and the number of degrees was more than triple, 293 degrees, compared with the turn of the millennium. 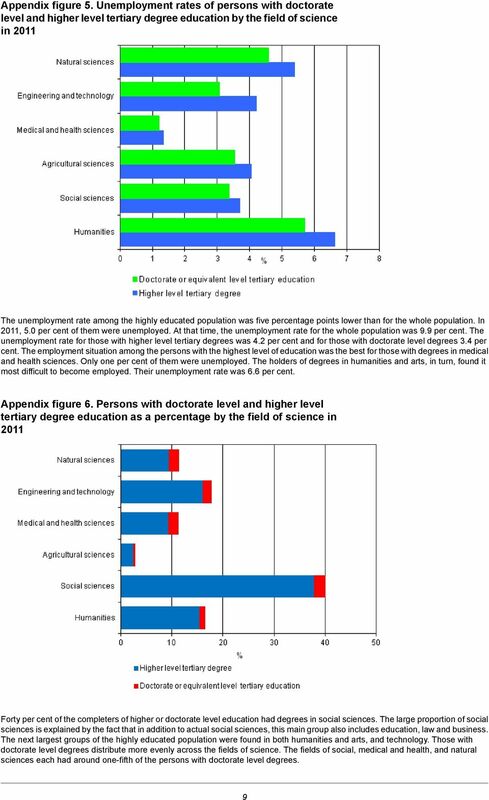 Doctorate degrees by field of science in 2000 and 2012 A majority of millennium doctors, 28 per cent attained their degree in the field of medical and health, good one-fifth in the fields of science and social sciences, 13 per cent in the field of technology, 12 per cent in the field of humanities, and four per cent in the field of agriculture and forestry. 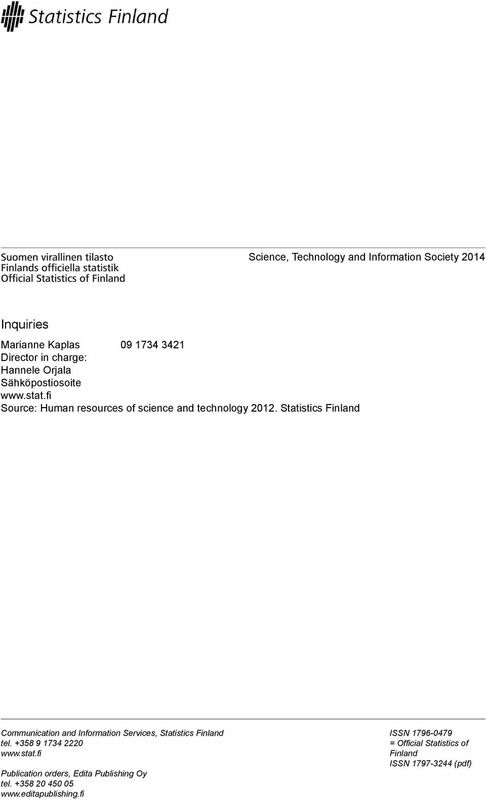 In 2012, double the number of doctors of science in technology were educated, in the field of social sciences the number Helsinki Quoting is encouraged provided Statistics Finland is acknowledged as the source. Supplier Diversity Program. Ensure a diversity of small businesses work with the Smithsonian to accomplish the Institution s mission. SWITCH TO THE NEW CLASSIFICATION OF ECONOMIC ACTIVITIES ( REV) 1 Introduction of new classification of activities (nace rev) 1.1. General Classifications of activities and products are revised periodically. Transport and Tourism 2014 Finnish Travel 2013 Finns' travel to Central Europe increased in 2013 According to Statistics Finland's survey, Finns made 7.8 million different leisure trips abroad in 2013.
abcdefghijklmnopqrstuvwxyz1234567890-=+_)(*&^%$#@!~ ABCDEFGHIJKLMNOPQRSTUVWXYZ ENERGY BALANCES 2012 Afghanistan production 31992...... 5619 15474.. 3161.. 56246 18635 Imports.. 5781.. 237042.. 1.. 11056..